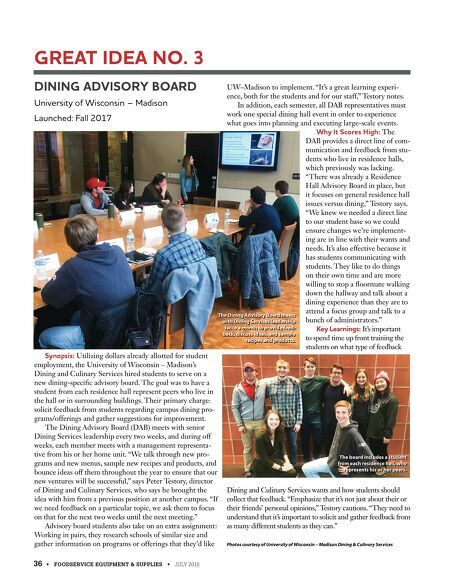 36 • FOODSERVICE EQUIPMENT & SUPPLIES • JULY 2018 DINING ADVISORY BOARD University of Wisconsin – Madison Launched: Fall 2017 Synopsis: Utilizing dollars already allotted for student employment, the University of Wisconsin – Madison's Dining and Culinary Services hired students to serve on a new dining-specific advisory board. The goal was to have a student from each residence hall represent peers who live in the hall or in surrounding buildings. Their primary charge: solicit feedback from students regarding campus dining pro- grams/offerings and gather suggestions for improvement. The Dining Advisory Board (DAB) meets with senior Dining Services leadership every two weeks, and during off weeks, each member meets with a management representa- tive from his or her home unit. "We talk through new pro- grams and new menus, sample new recipes and products, and bounce ideas off them throughout the year to ensure that our new ventures will be successful," says Peter Testory, director of Dining and Culinary Services, who says he brought the idea with him from a previous position at another campus. "If we need feedback on a particular topic, we ask them to focus on that for the next two weeks until the next meeting." Advisory board students also take on an extra assignment: Working in pairs, they research schools of similar size and gather information on programs or offerings that they'd like UW–Madison to implement. "It's a great learning experi- ence, both for the students and for our staff," Testory notes. In addition, each semester, all DAB representatives must work one special dining hall event in order to experience what goes into planning and executing large-scale events. Why It Scores High: The DAB provides a direct line of com- munication and feedback from stu- dents who live in residence halls, which previously was lacking. "There was already a Residence Hall Advisory Board in place, but it focuses on general residence hall issues versus dining," Testory says. "We knew we needed a direct line to our student base so we could ensure changes we're implement- ing are in line with their wants and needs. It's also effective because it has students communicating with students. They like to do things on their own time and are more willing to stop a floormate walking down the hallway and talk about a dining experience than they are to attend a focus group and talk to a bunch of administrators." Key Learnings: It's important to spend time up front training the students on what type of feedback Dining and Culinary Services wants and how students should collect that feedback. "Emphasize that it's not just about their or their friends' personal opinions," Testory cautions. "They need to understand that it's important to solicit and gather feedback from as many different students as they can." 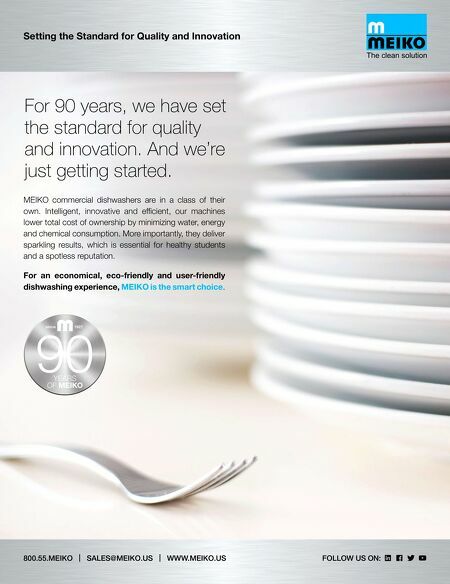 Photos courtesy of University of Wisconsin – Madison Dining & Culinary Services GREAT IDEA NO. 3 The Dining Advisory Board meets with Dining Services leadership twice a month to provide feed- back, discuss ideas, and sample recipes and products. The board includes a student from each residence hall, who represents his or her peers.